Thread: Have your say on new forums & subforums! Get rid of Sport and Debates. 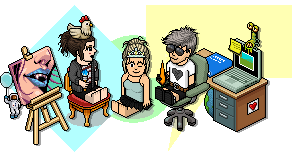 Just thought then, how about renaming "Welcome To Habbox Forum / Goodbye" as simply "The Lobby" as in like a hotel? The description itself could say along the lines of "Just arrived or biding us farewell? Meet and Greet in our Lobby!" something along those lines. It personalises the forums then, rather than them just being quite y'know plain and functionalist. I mean, you could even go further and rename "Current Affairs" into the "The Threatredrome" or "The Speakers Corner" and simply put its function in the description. "Discuss Anything" could become "Anywhere and Everything" - that sort of thing. Simple, *interesting* titles with functionalist descriptions. It's a bit like a newspaper article. You have an attention grabbing (but short simple) title and the subtitle does the explaining. Last edited by -:Undertaker:-; 09-09-2018 at 06:26 PM. I love this idea personally but I have to be honest, I'm not 100% sure on it! I'll tell you why: the main point of all this is to make it AS EASY AS POSSIBLE for people to be able to find where to post the threads they want! Although there is the subtitle, in my experience/training of web design, people focus almost solely on the title and will not bother reading the little text underneath!! I think we could get away with some of the main forums like those being given special themed names, although I understand what you mean - certainly if you were to do this with every forum it'd be too much and would ruin it! A load of threads need to be unstuck too, I know in the Current Affairs forum the 2016 referendum & US Presidency threads are still up as well as the 2017 UK elex one. Maybe have all moderators all do a cull/tidy up in their forum areas? @Neversoft; omg it was such a mess going through the style, some "and" some commas and some "&", I thought I caught most but will definitely be going through again as it bugs me too... also sorry about removing anime from the title, just wanted to make it more all encompassing and didn't wanna call it "books and podcasts and anime and others"
@-:Undertaker:-; the mod team will be mobilised shortly for that and to get some relevant threads in all forums!! Last edited by lawrawrrr; 09-09-2018 at 10:25 PM. No, that's cool. I'm not complaining, just reminiscing. Almost everyone who used to post about anime isn't around anymore anyway, so it makes sense to open it up. I think you did a great job, it looks a lot more compact. Just had a look — I never actually noticed how much the headings swap between using '&' and 'and.' 'Buy & Sell VIP, Donator and Icons' even uses both. I think words look nicer than logograms, but I don't know what the general consensus is. The only thing I will suggest are the uppercase letters like I mentioned ('Photography and Art' over 'Photography and art,' etc.) and perhaps 'General Discussion' over 'Chat About Anything.' 'Chat About Anything' and 'Discuss Anything' suggest that there's no need to ever use the other sections if anything can be posted there, but 'General Discussion' works better for general talk that isn't really specific to the other sections. Just my thoughts, though.